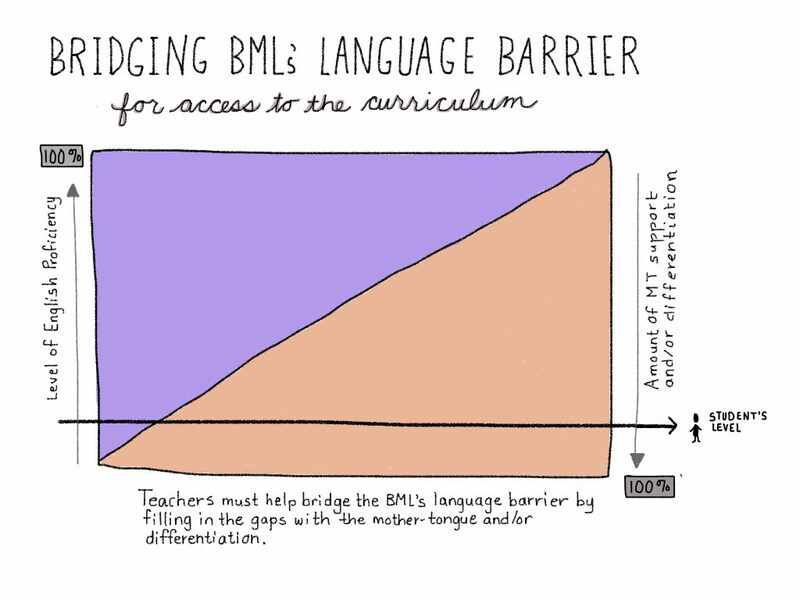 One of the most common mistakes that I see being made with BMLs is that they are put into lower-ability groups or given ‘easy’ work because they struggle to access learning content. Research suggests that BMLs (like all students) require an ‘enriched’ learning environment which stimulates their cognitive development and, at the same time, enables the development of their language acquisition (Thomas & Collier, 1997). 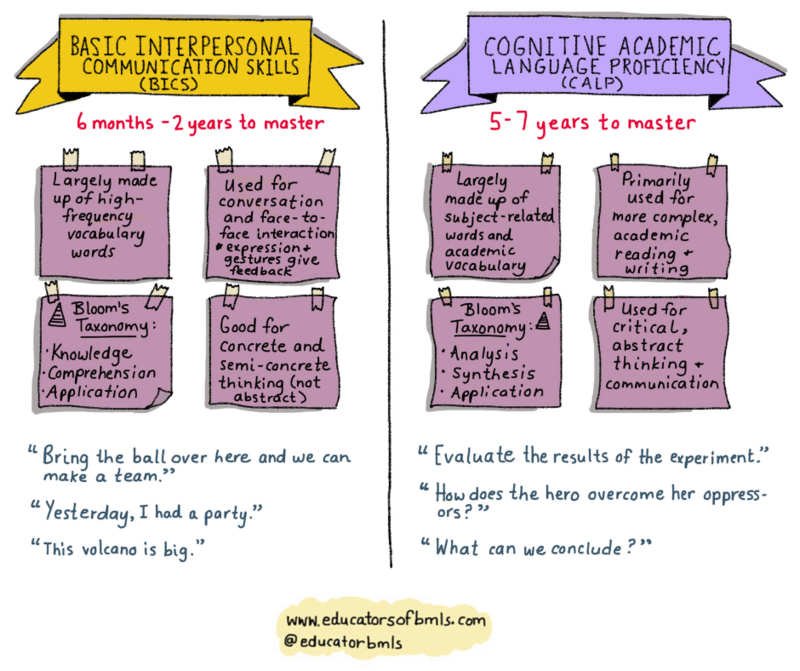 This equates to challenging or rigorous learning opportunities where BMLs are able to scaffold their language-learning. Many BMLs are high academic achievers in their home country, but when they come to their new English school, things are very different because they can’t access the language of learning. As a result, many students are given more simplistic work or put into lower-ability groupings. I once worked with a BML who was an outstanding mathematics student and he was put into the lowest-ability group in his Year 6 class. Every day he was angry and resentful. 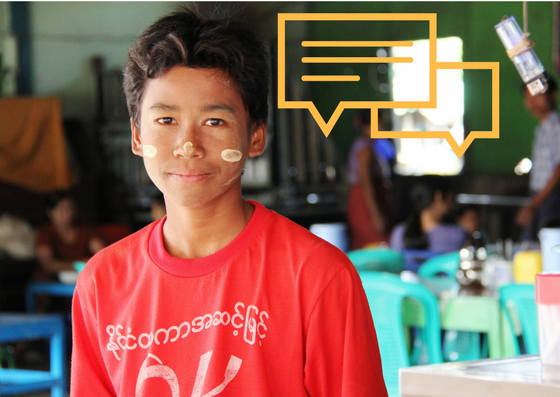 This greatly affected his self-esteem and attitude towards school and learning. He became disengaged and his marks started to reflect this. Since this boy wasn’t challenged academically, his inclusion in the group became a self-fulfilling prophecy because he eventually began to under-perform and was soon identified as an under-achiever by his peers and teachers. The reality is that many teachers are simply not given adequate training to understand BMLs or support their unique needs. In light of this, I want to share some insights and practical strategies that you can use immediately to help your BMLs get access to the right level of learning while providing an enriching and stimulating environment. First, it’s important to understand that most BMLs who come to you in this position will have knowledge of their home language and literacy. This means that you can tap into this wonderful resource in order to naturally support their learning in English. Don’t be afraid to empower your BMLs to use their home languages for learning tasks. Let them do research online, allow them to talk to same-language peers and even write their ideas in their own languages. BMLs must not STOP their learning from continuing at a similar rate and pace as they’re previously accustomed to. Then, to build up their English acquisition, you can have them write key points or even words and phrases in English to summarise what they’ve learned. Alternatively, you can have their work translated by a peer, a staff or even a parent who speaks their language if you need to. There is no harm in supporting this strategy and it doesn’t mean students’ English will be jeopardised as a result. If we look at the image above, we can see students are more reliant on their mother-tongue/home language when they first begin English. They have the full use and potential of their language but then may have very little English proficiency at this stage. Then, as they continue to be immersed in English from year-to-year, they start to use their English language for learning and thinking; thereby having to rely much less on their mother-tongue. In fact, if BMLs actually stop their mother-tongue language over the longer term, English will take over as their dominant language. This is why it’s important to encourage parents of BMLs to continue to maintain their home languages by speaking it at home and even going to external classes to maintain literacy. Now you now the first (and often easiest) strategy for supporting BMLs to learn content—encouraging them to use their mother-tongue/home languages. Be sure to share this strategy with their parent(s) so they know why their child is spending time learning in their home language and not English. Naturally, this can be confusing to some parents! You can easily assure them that this will not take away from their learning of English, particularly because they are fully immersed in English and English interactions all day. Strategy number two might be obvious to you: Differentiate the learning. 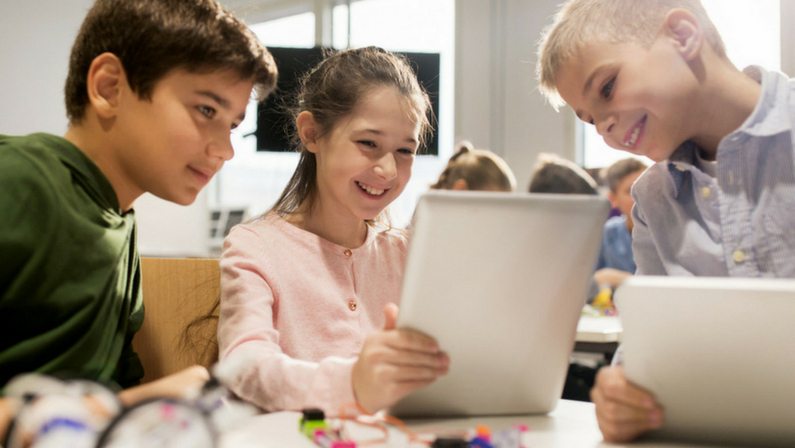 I know this is a buzzword that gets over-used but it’s often not done correctly–so that learners are actually able to access content at their level. The very first thing you need to know in order to differentiate properly is the literacy levels of all your students. Then you’ll know what kinds of texts you can use with different students and this helps you to make decisions about various learning tasks. I know it’s not standard practise to share literacy levels with all teachers who work with students but it really should be. It’s often kept in the English teacher’s files somewhere, but consider this information GOLD for each and every teacher who works with students—from the art teacher to the Science teacher. We suggest having a shared online platform to post student literacy levels for full and immediate teacher access. 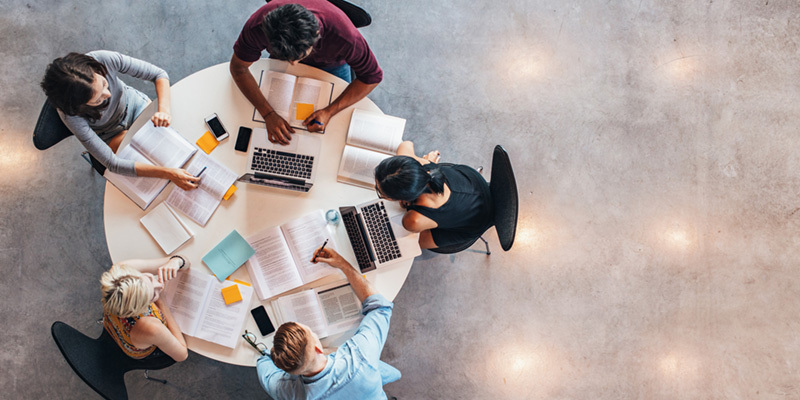 The key to successful differentiating is to be sure you’ve targeted learning at the right place for students—this is typically at their ‘instructional level’. The instructional level is the ‘just right’ level where there’s a little challenge but not too much. It gives students some room for growth. If the learning is too difficult, that’s at the ‘frustration level’ and it means students won’t benefit from learning, they’ll need a great deal of support (aka ‘spoon-feeding’) from the adult because it’s just too hard for them to work on their own. At the other end of the spectrum is ‘independent level’ and this refers to learning that’s at the mastery level. It’s easy for students to do on their own and doesn’t offer much in way of challenge. When you’re designing learning tasks, activities or projects, make sure you’re aiming for students’ instructional levels in terms of concept learning but don’t be afraid to allow BMLs to access learning by using texts that are at the ‘easy/independent’ level. This will help them quickly and easily access background information and gather facts. The next challenge for teachers is how to differentiate tasks in a work-smart manner so you don’t kill yourself? Well, that’s easy-enough. Just think about the learning as a funnel. You create all the learning tasks and activities to meet the core learning objectives or goals. For your native English speakers, they can most likely benefit from, and complete, all of these learning tasks largely on their own. On the other hand, for your BMLs, they need some adjusting or ‘tweaking’ to the learning. Now think about moving the concepts down into the funnel—the funnel hole gets narrower so you must only focus on the most critical core components of the learning so they fit into the funnel. Differentiating for BMLs can easily mean narrowing your focus for the unit/lesson. For example, if the central concept of the learning in English is “to understand plot elements through short stories” and your BMLs can’t access the grade/year-level short stories, then just narrow the focus of the lesson to “understanding plot” with one story or one short story that’s pitched right to their level. You have to make sure that you’re not taking any of the core learning away so maintaining focus on ‘plot’ and ‘story’ is essential. In this case, you can have BMLs read a book at their level so they can access the understanding of plot elements on their own. They could even read a book in their home language and analyse plot. Don’t make things too difficult for yourself so you end up designing laborious individual lessons for each student. Stick with the main lesson goals and objectives and then filter it through the proverbial funnel to make it accessible to your BMLs. Take into consideration that BMLs may require much longer to complete tasks if they’re at the frustration level. That’s why everything needs to be on-level and this will eliminate your need to spoon-feed students. You want to see them working as independently as anyone else when they set out to work and you also want them to feel challenged and engaged. This will help them view themselves as competent and able. One of the worries that teachers often have about differentiating learning for BMLs is that ‘sooner or later they need to do the real work.’ They’re right about that actually. Depending on the BML’s current stage of English acquisition, they will certainly be able to do the ‘real’ work–but often later rather than sooner in many cases. This is because it takes a BML around 2 years to master conversational English but 5-7 years to master academic English. So, in time, with good language exposure and continued understanding and support from teachers who are dedicated and caring, BMLs can and will be more likely to succeed in both their academic English and their academic learning. Still have questions about your BMLs or differentiating? Feel free to drop me an email (alison@educatorsofbmls.com) or comment down below and I’d love to help you! Cultural assimilation, language loss and language extinction are some of the threats that can impact cultures, communities and social ecosystems. This is why UNESCO promotes International Mother-Language Day on Feb 21st each year—to build awareness of the importance of language diversity and preservation. 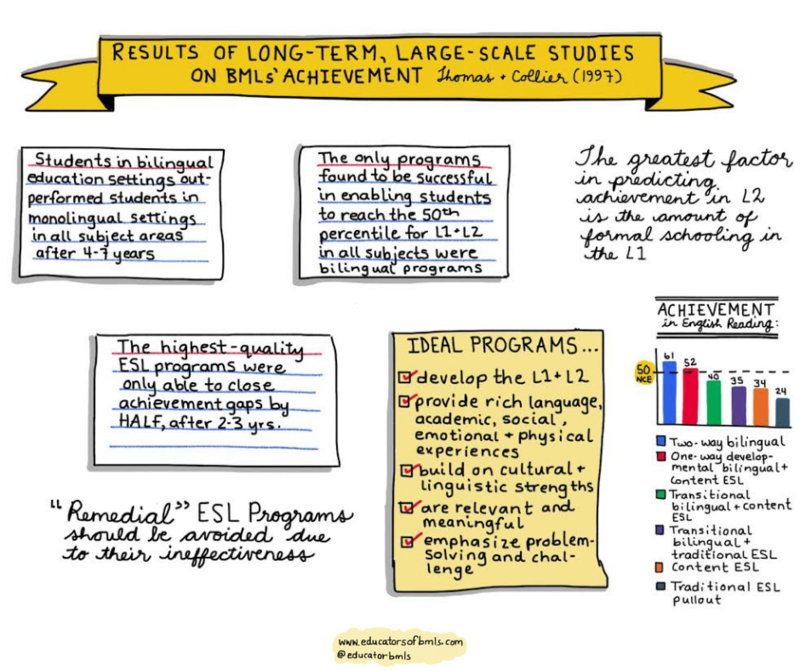 As a teacher, you’re on the frontline of this movement with your bilingual and multilingual learners—many of whom are already experiencing language attrition or language loss as a result of becoming ‘subtractive’ bilinguals over time. With the spread of English education around the world combined with its rising social ‘status,’ many parents are erroneously wooed into the belief that ‘English is best.’ Many simply aren’t aware of the value of their mother-tongue languages. It’s suggested that around 90% of the worlds languages will be extinct before the end of this century (Eschner, 2017). Mother-Language Day is a day to recognize the value that individual languages contribute to society, progress and humanity. For example, did you know that Inuit people hold little-known information about biodiversity and the environment in the Arctic? Or that the Berbers in North Africa possess thousands of years of knowledge about their desert ecosystem and water management in the Sahara? It’s clear that languages are reservoirs. They hold and carry important information that can be transmitted between language users from generation to generation. Just imagine what happens to that collective knowledge when a language dies out. Not only does significant scientific and historical information get lost but an entire cultural group—their way of life, their worldview and their impact on humanity—are erased. Open up your activities with a discussion about language and culture. Depending on the age of your students, discuss the significance of International Mother-Language Day, along with the cultural, social and psychological benefits of being bilingual or multilingual. Discuss the importance of maintaining languages and cultures as well as offering facts about the extinction of languages. Help your students realise the significance of their languages! At this early stage, young children are still learning the foundations of their languages and cultures through the world around them. Story books continue to be an important conduit for linguistic and social development. 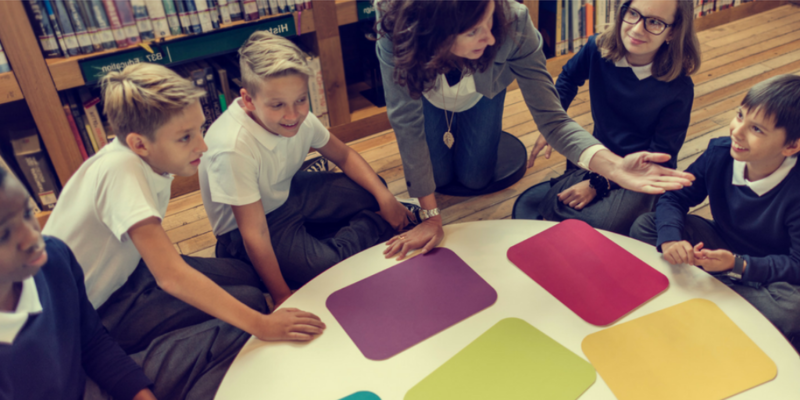 Capitalise on this high-impact activity by getting access to a variety of books in the different languages of your students. Invite parents to your school and have them read to groups of children who speak that particular language. You may want to mix different classes and groups of children together for this activity. 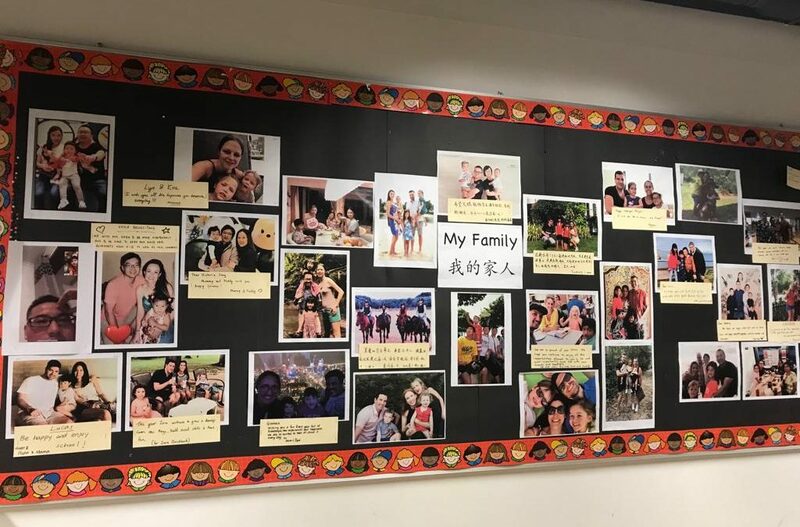 Have parents elicit discussions in the mother-tongue language and plan a follow-up activity for students to document their understanding and meaning of the story (e.g. a drawing, art/craft, role-play, etc.). 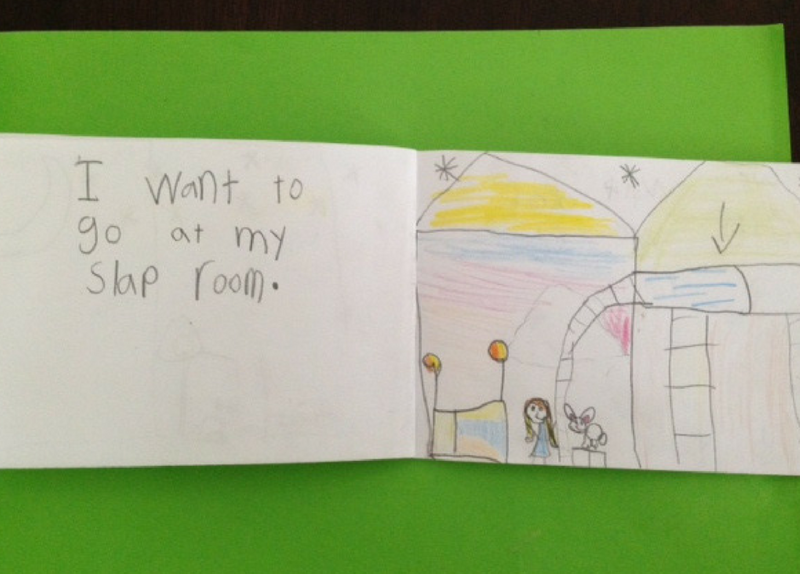 Have primary students tap into their languages by working in mother-tongue groups to create and illustrate their own storybooks. Have an older child who speaks the same language facilitate a group, providing support when required. Have materials and supplies ready for students’ booklets and make discussion and story-mapping an important pre-writing component. For students without any literacy in their mother-tongue language, you can have them ask their facilitator to write as they dictate or allow them to use phonetic spelling in English. The goal is for students to participate, share ideas and have fun through their mother-tongue languages. Try to keep students moving along despite their individual language levels. Identify and write common sayings or phrases from the language that others might like to learn and have them provide English translations. Have students explore proverbs from their languages with same-language peers. Proverbs often communicate the values of a culture and can be an interesting form of expression. For example the English proverb, “two wrongs don’t make a right” has quite a deep meaning and can serve as an open-ended prompt for dialogue. Have students come up with/research several examples of proverbs that are used in their language. Have them explain meanings in detail. Quite often, students from different language backgrounds discover their languages share similar proverbs so be sure to culminate this activity by encouraging students to share their work within the large group. Allow them to display their work creatively. An international teacher easily interacts with 10-20 different nationalities a day. These schools and classrooms are an anthropolgist’s dream. Just imagine all the fascinating cultural elements that could be explored through your students: attitudes, cultural practices, traditions, taboos and social behaviour. The list coud go on and on. But just how often do we stop to look at our students as an enthnographers do, taking time to learn about their languages and cultures? Just how valuable are culture and language anyway? Let me tell you that they play an extremely important role in shaping our students’ identities and experiences. They can also help to build engagement and relevance in student learning. A Canadian educator, Rebecca, shared a very powerful story with me about her experiences teaching kindergarten in Korea. When she first started, she noticed her students were extremely quiet and avoided eye contact when she spoke to them. As the year went on, and as they became more proficient in English, she watched them become more open, feel comfortable speaking aloud and maintain eye contact when they spoke. One day, she invited the parents to visit the classroom. As they spent time in the class, they observed their children interacting with their teacher and other children. They were extremely surprised at how their children behaved. They noticed the children didn’t bow to their teacher and they spoke out openly to her. They also observed students making direct eye contact with their teacher, which is often considered a sign of disrespect in the Korean culture. They communicated their surprise and concern to Rebecca. This story illustrates the push-and-pull between cultures that can exist when students attend an international school. They often live between 2 cultures, with their family’s cultures and values played out at home and their international school offering a different (sometimes similar, sometimes very different) set of values and expectations. Educators can play a very important role in helping to mediate this tension for students. 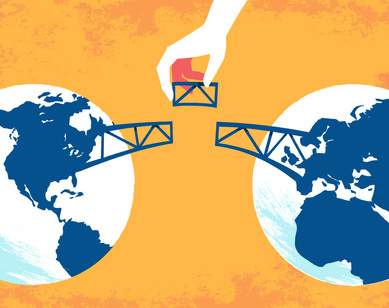 The policies and practices they implement in the school and classroom can help nurture both cultures so that they become interconnected, not disconnected. This process starts with first understanding the value of our students’ languages and cultures. Enable students to use their mother-tongue languages in the school and classroom. This is especially powerful for students who are not yet proficient enough in English to understand academic language or to think fluently in English. Getting students to brainstorm in their own languages before writing, or for tasks that involve higher-order thinking can bridge the language barrier and keep them learning content. These students can also benefit from reading important background information about class topics in their mother-tongue on the internet. This can help them keep up and understand what is going on in the classroom. You can also encourage your students who speak the same languages to discuss class concepts in their mother-tongue; this can make the learning much more meaningful for them. You will also be promoting the ongoing development of their home languages. Get rid of signs and policies that promote “English only,” in the school and classroom. This sends the message that English deserves a higher-status than students’ home language(s), even if not intentionally. Current research shows that supporting home languages or using bilingual approaches in the classroom does not harm students’ English language development; in fact it supports it. 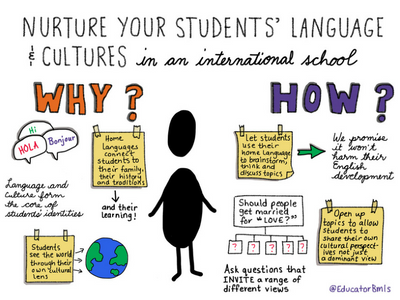 Engage students’ cultures for more meaningful and interesting learning. When planning lessons, build in opportunities to engage students’ prior knowledge through their own cultural perspectives. For example, if the topic is “World War II,” you could encourage students to find out what role their countries played in the war instead of reflecting on one dominant perspective. Similarly, you could extend a class unit on “communities” to allow your students to think about or research communities from their own cultures or countries. Broaden your classroom discussions by asking students’ to share their cultural perspectives on key topics or issues in a safe and respectful way. For example, if the class is studying “Romeo and Juliet” and the theme is “love,” students could share their own cultural belifes around love. Some students might come from cultures where love is not the main reason for marriage, for example, and this viewpoint could be shared within the classroom. These kinds of rich discussions need to be delivered in a nurturing environment where all students’ opinions and perspectives are valued by teachers who set the tone for an open and accepting classroom community. This is especially important when students’ viewpoints are likely to be different to the dominant perspective. Celebrate your students’ cultures and traditions. Have students share elements of their cultural practices or holidays with their class. Let them see that you are open to learning more about their culture and that you value it. This will help educate all of your students about the richness and diversity that different cultures have to offer. Teachers can play a very pivotal role in helping students mediate their home cultures and their “school cultures.” Both are important and contribute to a strong personal identity. As our world becomes more globalized, individuals with bicultural or multicultural knowledge will be a valuable asset and resource to their societies.